We have a one year old Miniature Australian Shepard and we have recently had some behavior problems with him. My dad is the head of the household and the dog, Tucker, minds him; however, he is always challenging him. Tucker is very protective of my mother and Tucker will lash out at my dad if he feels the need to protect my mom or if there is food involved. Food is a pretty big problem. This is has been going on for a few months and my dad and Tucker have worked on their relationship and we have worked with him and food. He is allowed to eat the food when we allow it. Now in the last few days Tucker has been giving the "cold eye", almost looking through us. You can see in his eyes how aggressive he is and we aren't sure what to do. Is this typical for this breed and what can we do about it? We love the dog very much but if the situation is unsafe there isn't a whole lot we can do. Hi Cassidy, It sounds like Tucker is trying to assume a leadership role in your family (pack). He may see himself as subordinate to your dad (barely) and as further up in rank to your mother. So he feels it is his job to protect her. It is good what you are doing with the food. Make sure that after you allow him to eat you don't leave the food out if he doesn't finish it. Just remove it until his next feeding time. Everyone in the family needs to be assertive and Tucker needs to be able to take direction from everyone and look to them for guidance on what to do rather than taking it upon himself to decide how things are going to be. For example, if you aren't doing so already, have everyone take turns with feeding Tucker so he begins to regard everyone as the provider of food. 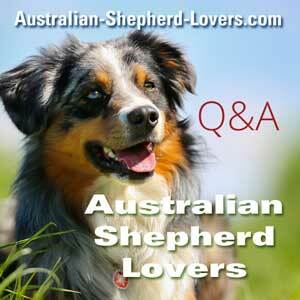 This is common with Australian Shepherds and, although they are considered a separate breed, with Minis as well. These are the warning signs, but hopefully you are catching his problem in time and will be able to turn things around. These problems tend to show a fundamental problem and you are likely to see other issues start to arise if they haven't already—like becoming demanding, pushing into personal space, jumping up, barking (to protect HIS territory), leading to actually biting. All of these behaviors can stem from a problem with the core dynamics of your family's relationship with Tucker. You may have seen in other posts that I recommend an online dog training program by "Doggy Dan," a professional dog trainer from New Zealand. His program is video-based and starts with those core principles upon which all dog training and good behavior are built. He also shows you how to apply those principles to specific behavior problems. But once you have the foundation established you'll have far fewer problems to begin with. In addition, there is a lot of confusion surrounding protection. From what you described, it sounds like Tucker is not protecting your mother, but is displaying territorial aggression or resource guarding behavior. A dog that is truly protecting someone does so only when it is deemed that there is a valid threat; if Tucker knows that your father is a member of the family and is not a valid threat, then this is not protection behavior. Such behavior should be discouraged in the ways previously mentioned, as well as by having your mother move away when Tucker is guarding her to illustrate that she is not his resource to guard. Having various members of the family feed Tucker will also reinforce the idea that everyone in the family is in control of his resources.